Educate yourself: Learn the physiological causes and effects of anxiety. Your symptoms/feelings stem from your fears, your thoughts, and your body’s own fight-or-flight response (an antiquated alarm system left over from our cavemen ancestors). Though the adrenaline rush is uncomfortable, these feelings aren’t harmful and can’t actually last very long. So, though your heart may be racing, that’s okay. You’re safe and in no real danger. Think about this: If you’ve had an anxiety attack, you’ve likely already experienced the worst your body can feel. Don’t be bluffed by physical feelings. Relax & take care of yourself: Learn to recognize when you’re feeling anxious and take the necessary steps to relax and take care of yourself (this includes identifying common triggers like alcohol, sleep, and caffeine). To reduce anxiety in the moment, try deep belly breathing or mindfulness meditation. Both of these help calm the adrenal response. To relieve more long-term tension, try progressive muscle relaxation or vigorous exercise. The main idea is to acquire tools to calm yourself whenever anxiety strikes, so you can more easily cope. Think about this:Your body is a machine like any other. If you take care of it, it’ll take care of you. Question your thoughts: Learn to judge your thoughts critically instead of accepting them as facts. Your thoughts, more than anything, affect how you feel and ultimately your perspective of the world. People with anxiety often have an intensely negative view. They overestimate the likelihood of something bad happening, exaggerate the consequences, and underestimate their ability to cope. So check your thoughts. What evidence do you have? What are the odds of this happening? What would a friend say to you? Think about this: Just because you think something does not make it true. You’re not a fortune teller, a mind-reader or the center of the universe. Try to see things in a more balanced way and you’ll feel better. Behave courageously: Learn to face your anxiety despite the fear. 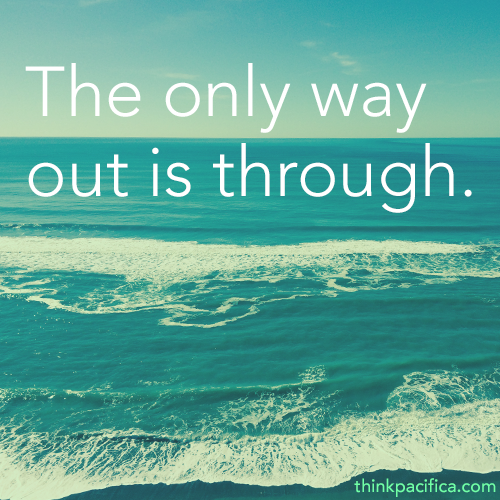 This is obviously the hardest part, but it’s also the way out. Anxiety has a way of chipping away at self-esteem. It’ll make you think you can’t do THIS or you can’t do THAT. It’s easy to get stuck in this cycle of fear. But you can face your fears a little each day, and eventually, work toward your bigger goals. It doesn’t matter how small the initial steps are. Instead of dread, try being curious in these new scenarios and use your coping skills. It’s not about being free of anxiety in these early moments, but enduring despite the anxious feelings. This is how real change happens. Think about this: By taking small steps each day, you can rebuild your confidence. You’re a lot stronger than you think you are. Don’t let anxiety dictate your life.